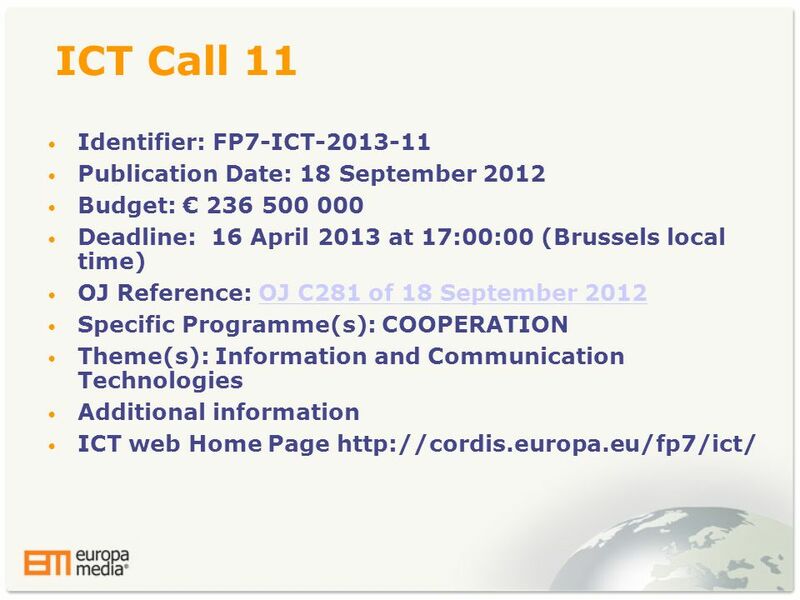 Az FP7 ismertetése és az ICT Call 11 bemutatása Connect-IT 2012 2012. December 7. 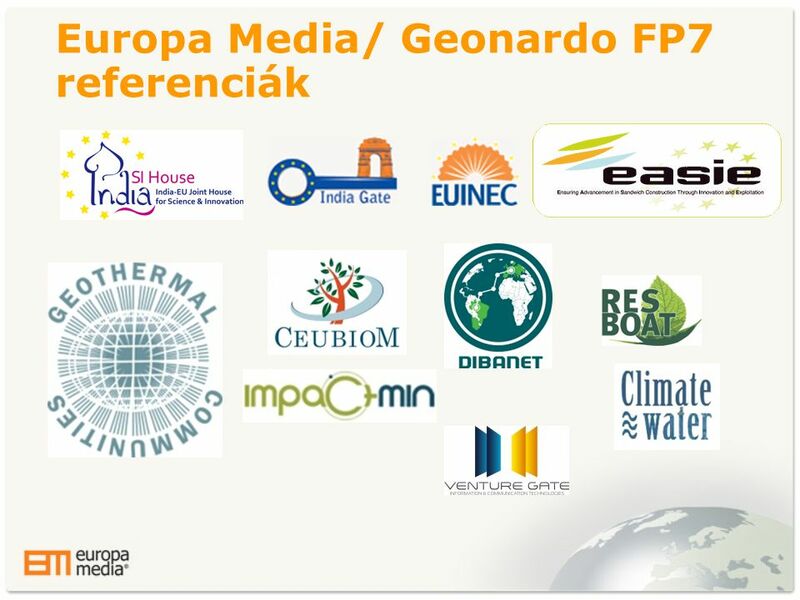 Gabriella Lovasz Ügyvezető igazgató Europa Media. 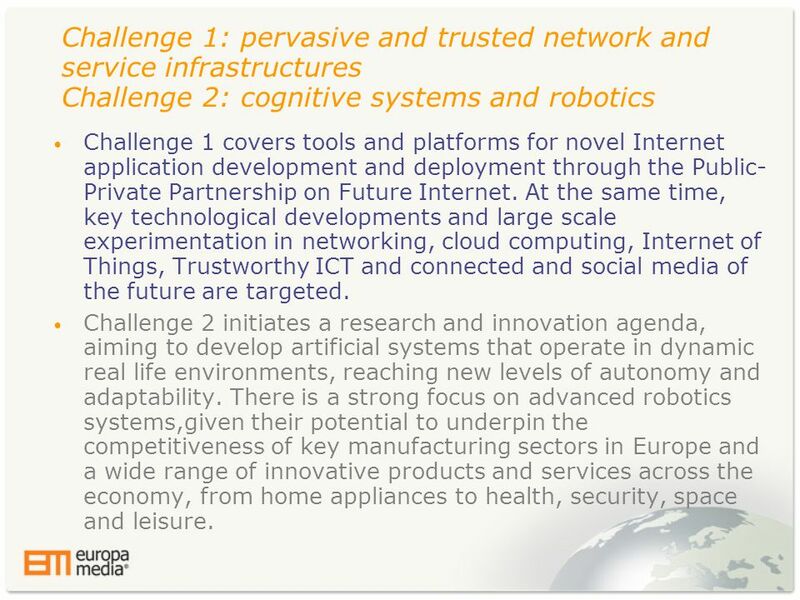 8 Challenge 1: pervasive and trusted network and service infrastructures Challenge 2: cognitive systems and robotics • Challenge 1 covers tools and platforms for novel Internet application development and deployment through the Public- Private Partnership on Future Internet. 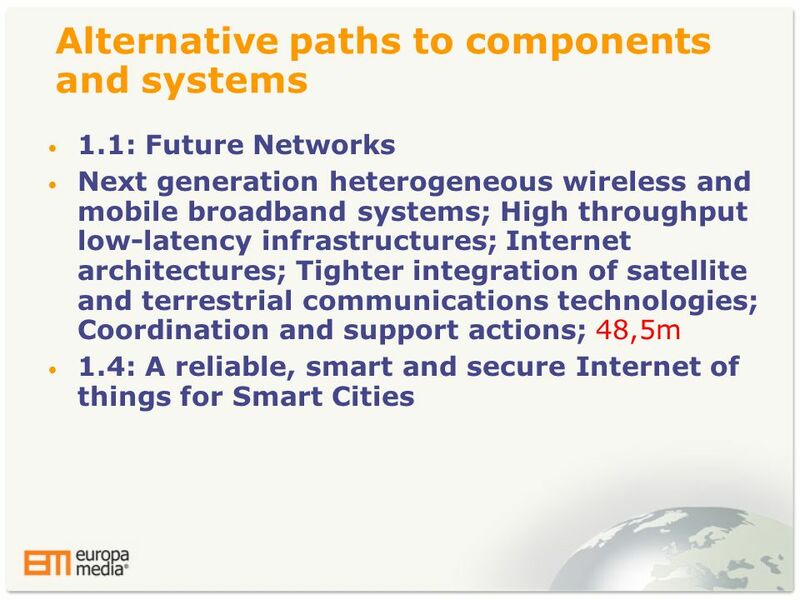 At the same time, key technological developments and large scale experimentation in networking, cloud computing, Internet of Things, Trustworthy ICT and connected and social media of the future are targeted. 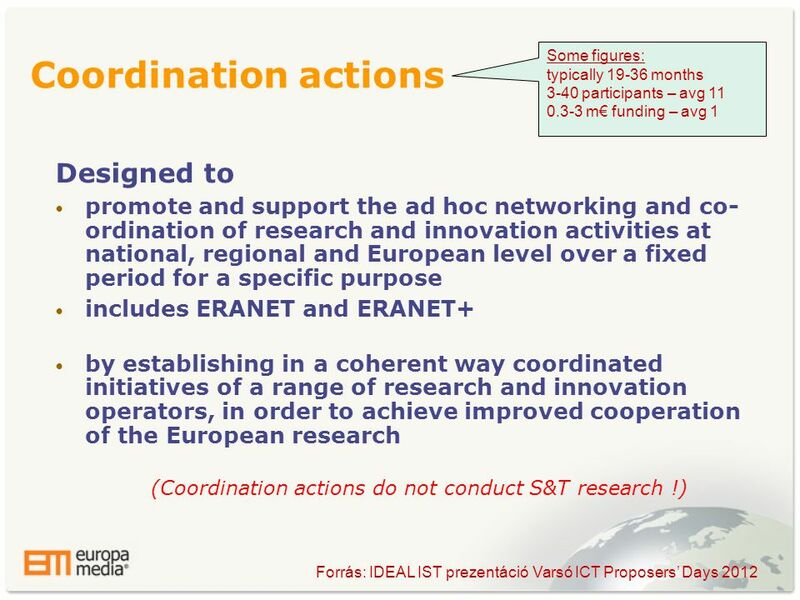 • Challenge 2 initiates a research and innovation agenda, aiming to develop artificial systems that operate in dynamic real life environments, reaching new levels of autonomy and adaptability. 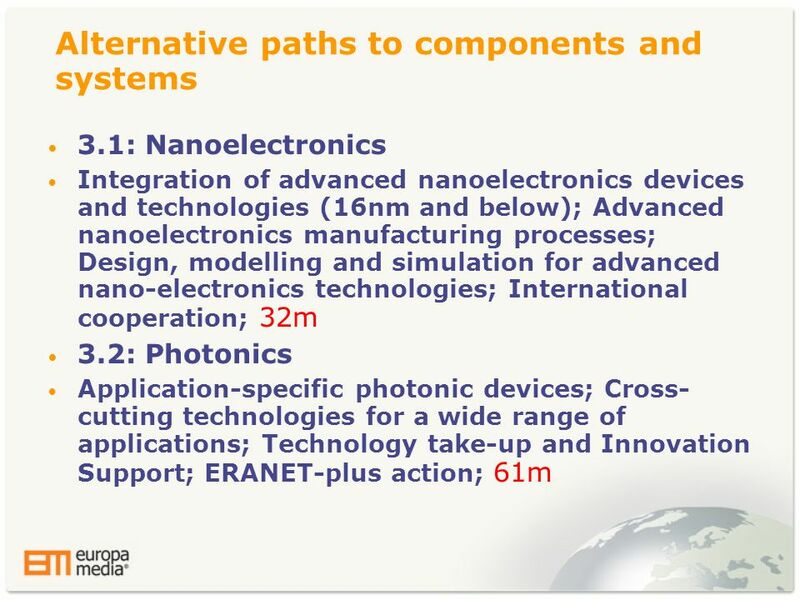 There is a strong focus on advanced robotics systems,given their potential to underpin the competitiveness of key manufacturing sectors in Europe and a wide range of innovative products and services across the economy, from home appliances to health, security, space and leisure. 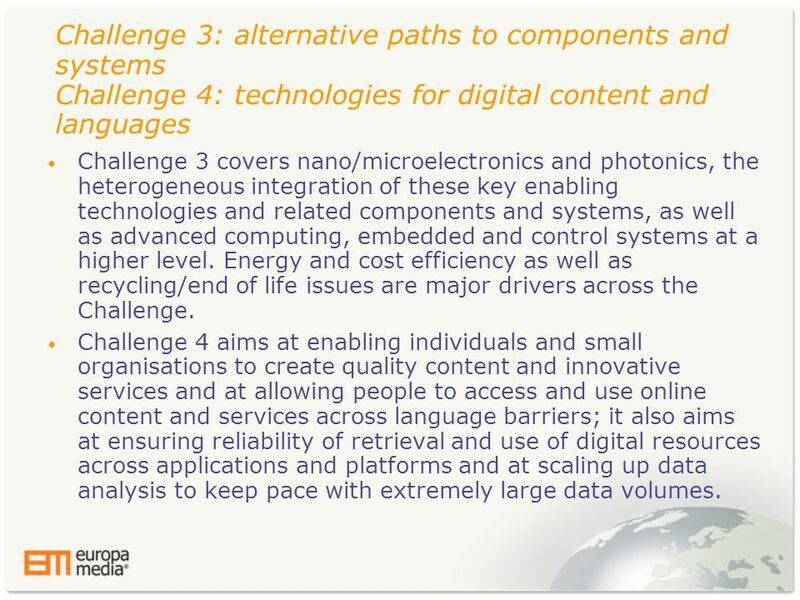 9 Challenge 3: alternative paths to components and systems Challenge 4: technologies for digital content and languages • Challenge 3 covers nano/microelectronics and photonics, the heterogeneous integration of these key enabling technologies and related components and systems, as well as advanced computing, embedded and control systems at a higher level. 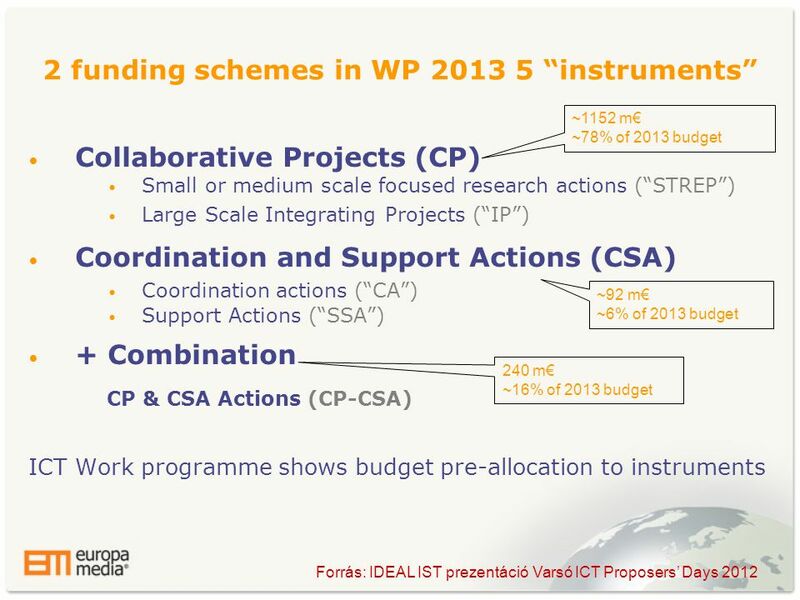 Energy and cost efficiency as well as recycling/end of life issues are major drivers across the Challenge. 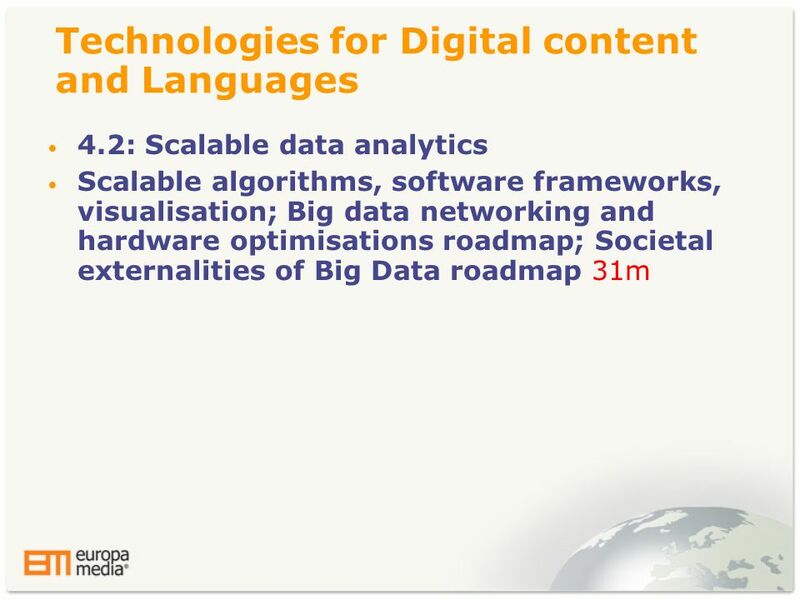 • Challenge 4 aims at enabling individuals and small organisations to create quality content and innovative services and at allowing people to access and use online content and services across language barriers; it also aims at ensuring reliability of retrieval and use of digital resources across applications and platforms and at scaling up data analysis to keep pace with extremely large data volumes. 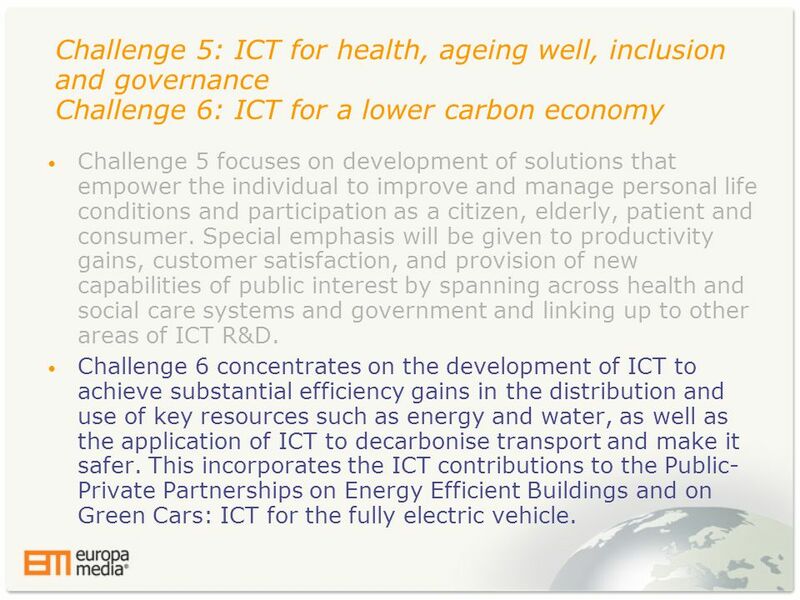 10 Challenge 5: ICT for health, ageing well, inclusion and governance Challenge 6: ICT for a lower carbon economy • Challenge 5 focuses on development of solutions that empower the individual to improve and manage personal life conditions and participation as a citizen, elderly, patient and consumer. 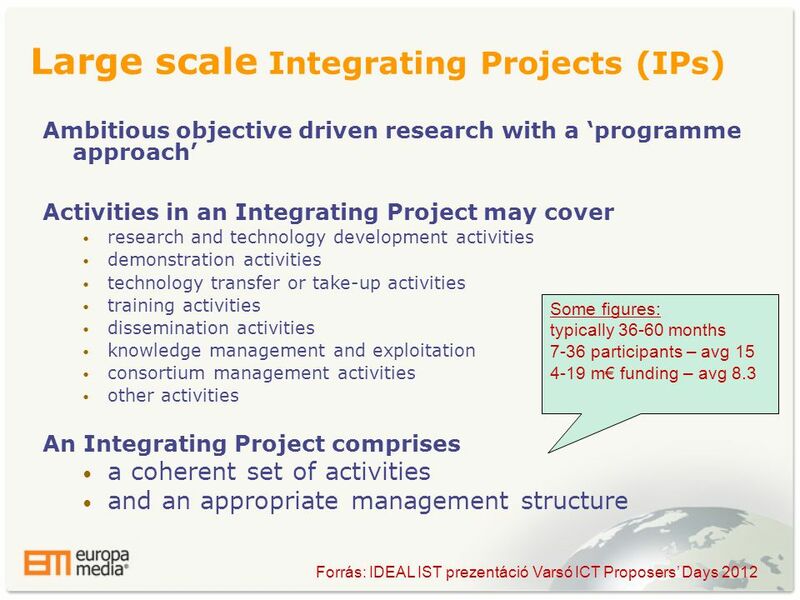 Special emphasis will be given to productivity gains, customer satisfaction, and provision of new capabilities of public interest by spanning across health and social care systems and government and linking up to other areas of ICT R&D. 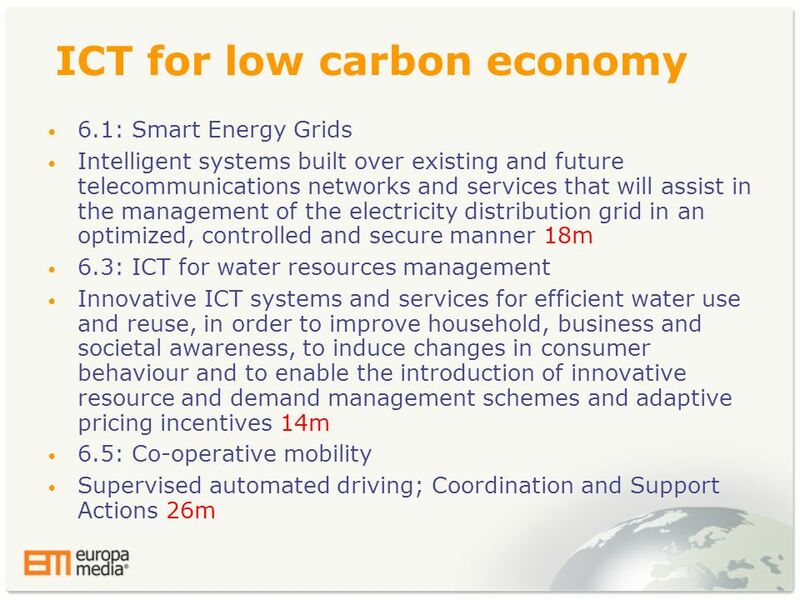 • Challenge 6 concentrates on the development of ICT to achieve substantial efficiency gains in the distribution and use of key resources such as energy and water, as well as the application of ICT to decarbonise transport and make it safer. 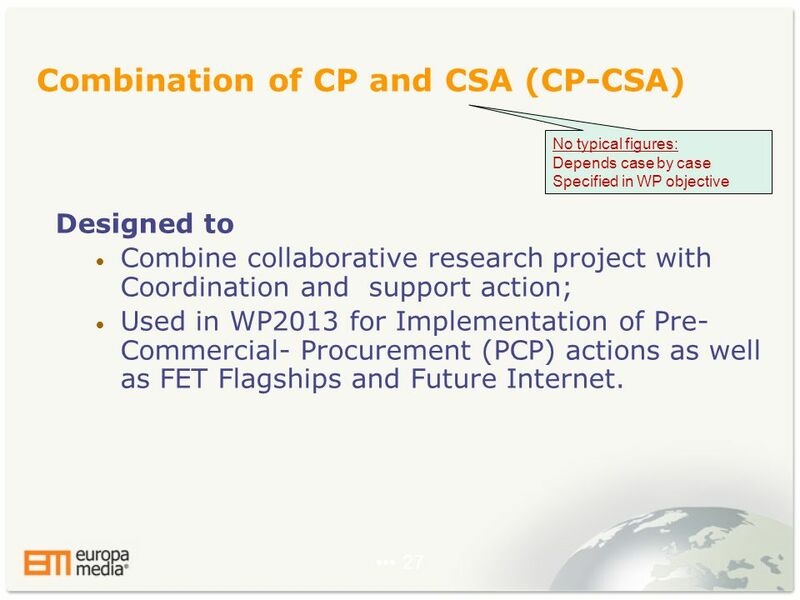 This incorporates the ICT contributions to the Public- Private Partnerships on Energy Efficient Buildings and on Green Cars: ICT for the fully electric vehicle. 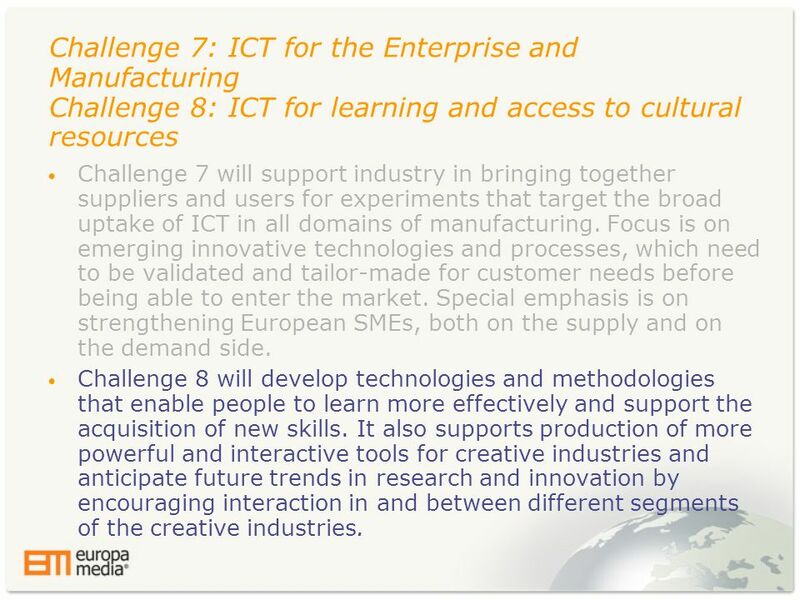 11 Challenge 7: ICT for the Enterprise and Manufacturing Challenge 8: ICT for learning and access to cultural resources • Challenge 7 will support industry in bringing together suppliers and users for experiments that target the broad uptake of ICT in all domains of manufacturing. 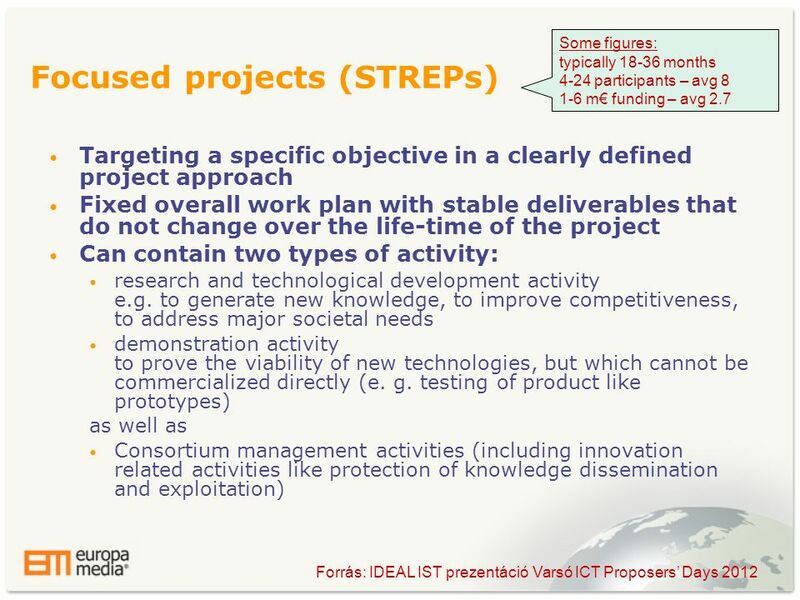 Focus is on emerging innovative technologies and processes, which need to be validated and tailor-made for customer needs before being able to enter the market. 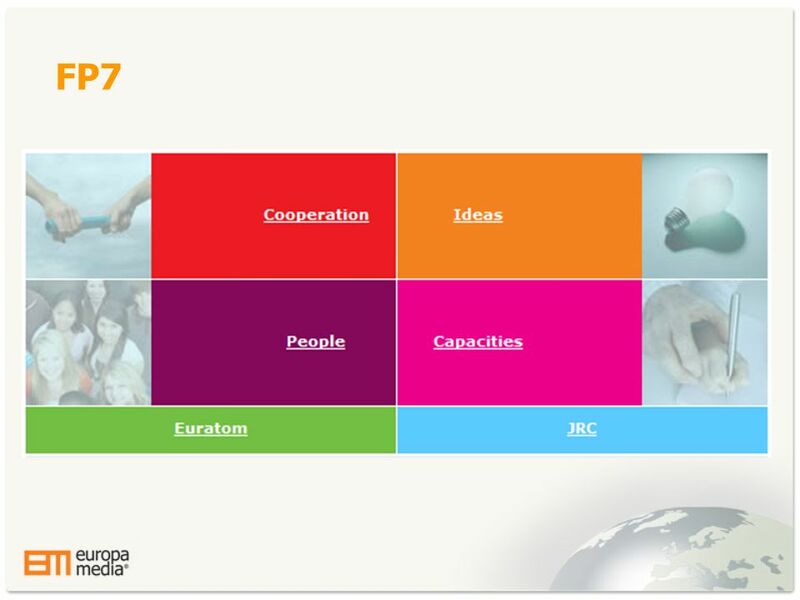 Special emphasis is on strengthening European SMEs, both on the supply and on the demand side. 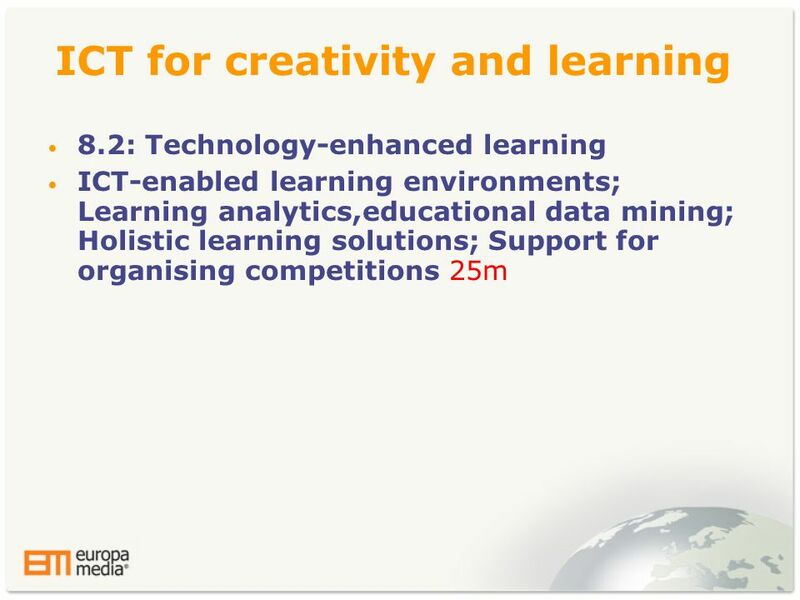 • Challenge 8 will develop technologies and methodologies that enable people to learn more effectively and support the acquisition of new skills. 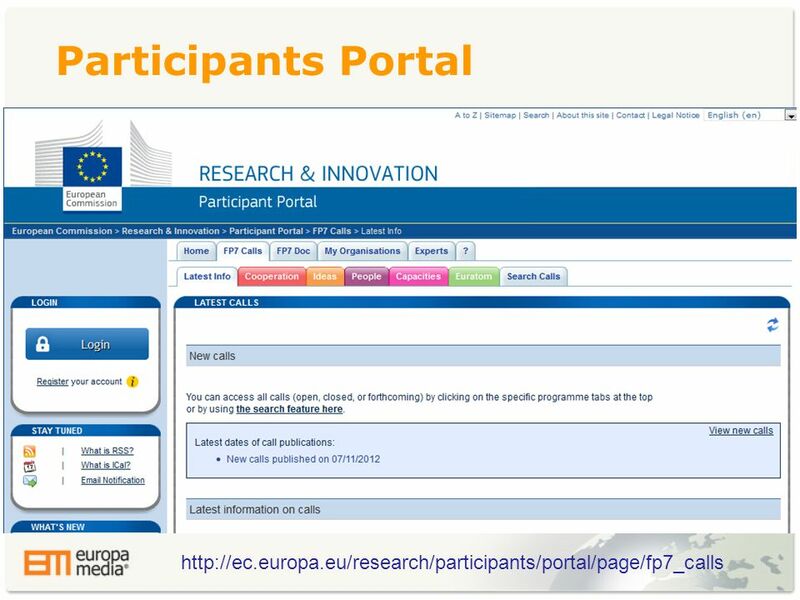 It also supports production of more powerful and interactive tools for creative industries and anticipate future trends in research and innovation by encouraging interaction in and between different segments of the creative industries. 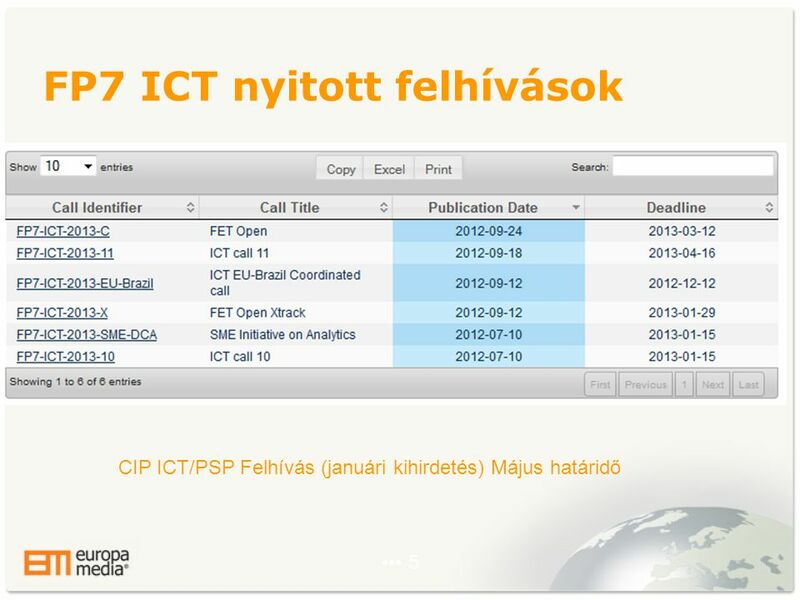 19 Pályázat beadása Pre-proposal submission!! 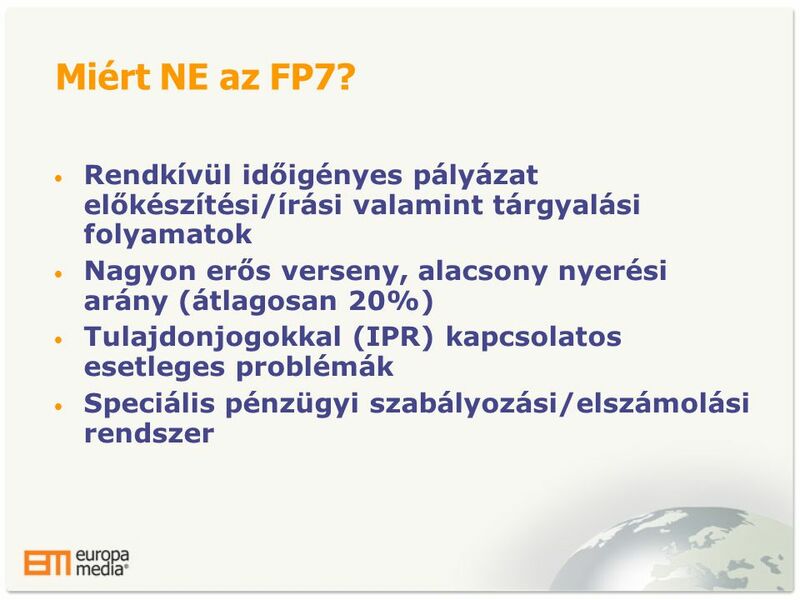 36 Köszönöm a figyelmet! 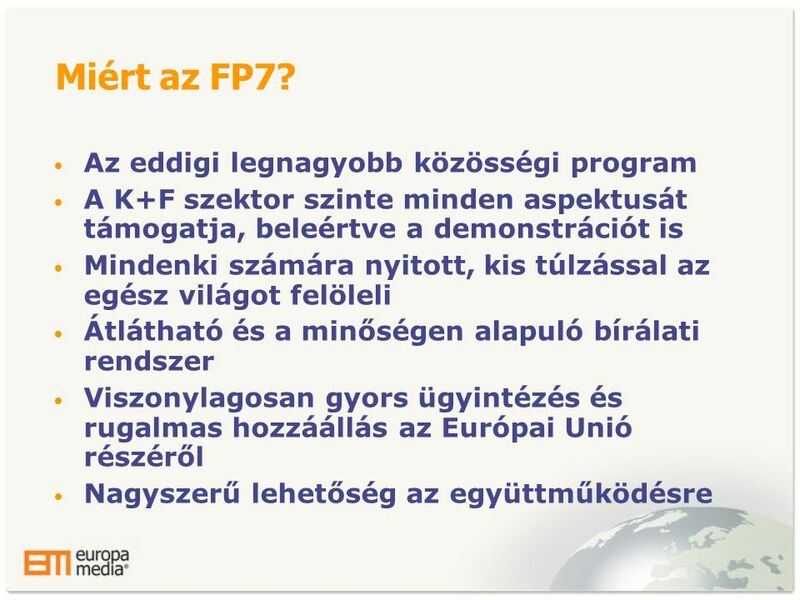 Kérdések? 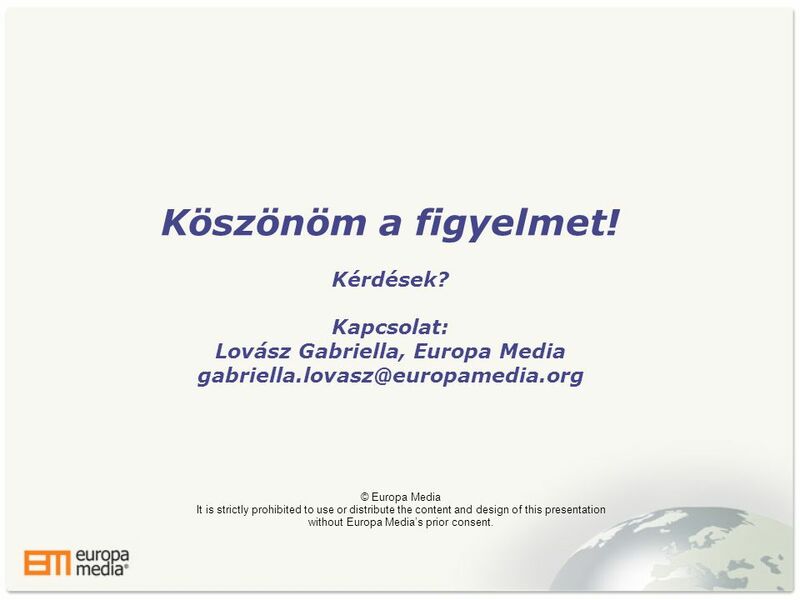 Kapcsolat: Lovász Gabriella, Europa Media gabriella.lovasz@europamedia.org © Europa Media It is strictly prohibited to use or distribute the content and design of this presentation without Europa Media’s prior consent. 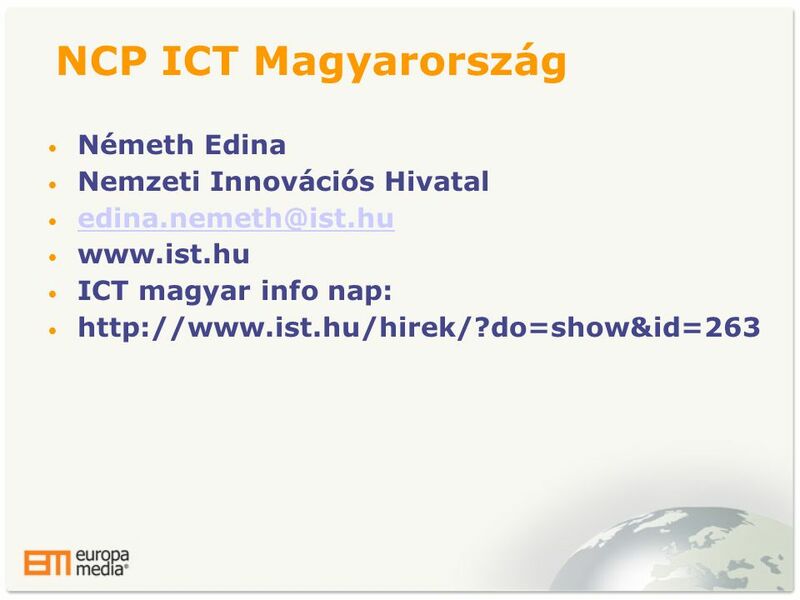 Letölteni ppt "Az FP7 ismertetése és az ICT Call 11 bemutatása Connect-IT 2012 2012. December 7. 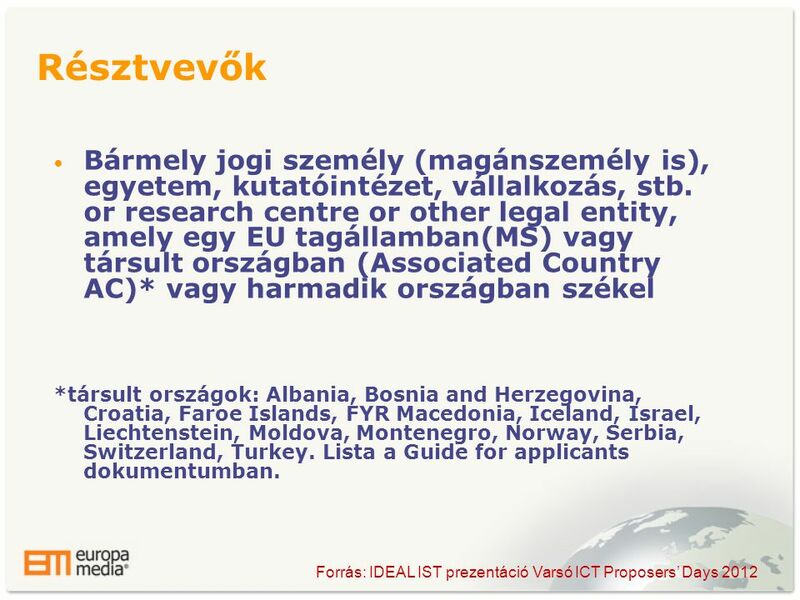 Gabriella Lovasz Ügyvezető igazgató Europa Media." URBACT II – National Training Seminar, Hungary The changing URBACT context: Cohesion Policy developments 10 May 2013, Budapest Iván Tosics TPM. 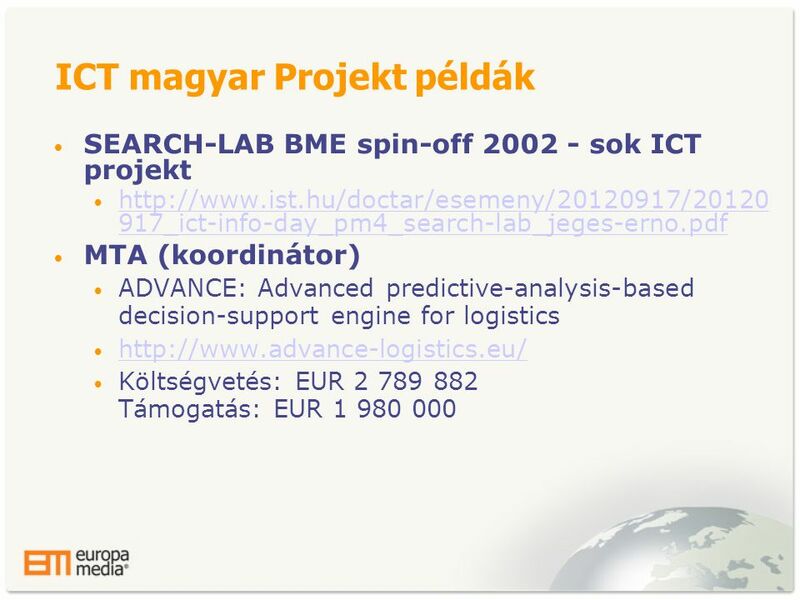 A magyar tudomány az európai kutatási infrastrukturában: lehetőségek és kockázatok Mezei Ferenc MTA Wigner FK, Budapest és European Spallation Source ESS.